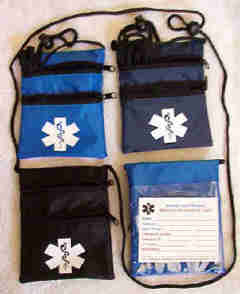 Medical Alert Wallets, nylon neck wallets with 2 zippers have a Medical symbol silk screened in white just below the lower zipper outside. The zippered pockets are perfect for medicines and supplies for your daily routine. The upper zippered pocket is as big as the wallet itself, approx. 5" tall and 4" wide. The lower zippered pocket is half the height and wide as the wallet itself. 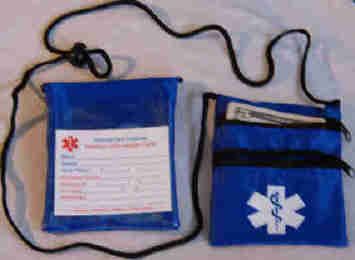 On the opposite side of this neck wallet is a large clear window pouch, with a Large Medical Information Card for you to fill out. This neck wallet has a large 42" adjustable cord. Three colors; black, navy blue and royal blue. If for some reason you don't want to use the PayPal secure online payment process, please click here. Shipping outside the United States and Canada require different shipping and handling charges. Please see Medical Alert Wallets policy and terms page for international shipping charges. People with a medical condition, take medicines or allergic to anything, especially a specific medicine, should have a Medical symbol on then somewhere and what a better way than to have one on a neck wallet with your current medical information you've printed on the large Medical Information Card. 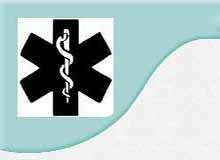 All Medical response teams are trained to recognize a Medical symbol. If you were wearing a Medical Neck Wallet and something happened to you and you were down and out the Medical Response Teams will go toward your chest, for various reasons, air, heart, etc. Then they will see the Medical symbol and the Medical Information Card on the outside of your Medical Neck Wallet. Now they have your medical information to help get you the correct aid right there on the spot, if possible. You'll get a better feeling of Safety and Security knowing you have a Medical Wallet on you! This Nylon Neck Medical Wallet is perfect for anyone in Rehabilitation, Physical Therapy or simply doing your exercises at home or at the gym.